Keswick Ministries launches its first ever event app in the run-up to its 142nd annual Convention. 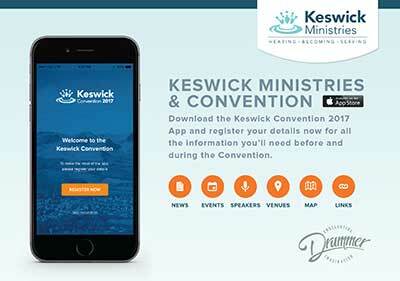 With an ever-growing number of younger families attending the Keswick Convention, Keswick Ministries has stepped up its use of digital media and the app will allow users to pick and choose their favourite event elements and create their own “My Keswick” from an array of bible readings, seminars, evening celebrations and concerts on offer. Jutta Devenish, Head of Communications & Development explains: “Over the last year and a half, as part of our desire to engage with our audiences through a wider mix of communication channels, we have worked hard to broaden our digital footprint. The app is available through the Apple Store and, by the time the Convention begins, will also be available to Android users. Throughout the year, users will get first-hand access to new Christian resources and news on other ministry offerings such as the charity’s brand-new teaching and training programme in the Lake District. The Keswick Ministries App has been developed with the help of The Drummer Agency, a full-service marketing and integrated communications agency, and trusted partner of Keswick Ministries. This year’s Convention on the theme, Captivated: Hearing God’s Word, runs from 15 July – 4 August 2017 and welcomes speakers from around the world, including Don Carson, Alistair Begg and Ivor Poobalan. The event is free of charge. To find out more go to www.keswickministries.org/convention. Keswick Ministries resources Christians as they serve God for His mission in the world. It does so through hosting an annual three-week Convention in Keswick, providing resources through a variety of media and encouraging a UK and Global movement committed to Hearing God’s Word, Becoming like God’s Son and Serving God’s Mission. The Keswick Convention has been running for more than 140 years and now attracts more than 12,000 visitors each summer.